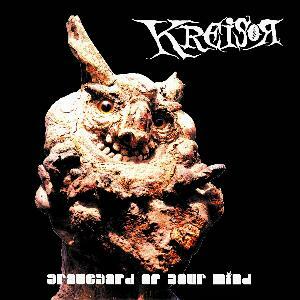 Kreisor - "Graveyard Of Your Mind"
The band used to be called Aytobach Kreisor and has produced one EP and full length CD prior to this release. The band have really changed their approach to songs on this effort and went for a more psychedelic sound this time and also more focused on rocking! The CD opens with the excellent Reloader, with its classic rock approach and phased out guitar and vocals. Trilight is the bands radio friendly bouncy rock number. Work is a hard hitting Motorhead like song. The bands cover version of Waiting For The Sun by the Doors is quite cool. Lazarus begins with a drum solo and then really takes off at high speed and has a great riff, harkening back to Captain Beyond. The end of the CD has several songs that go for a more psychedelic rock sound with the mix and layered guitars. Graveyard Of Your Mind really reminds you of the early 70s sound of bands like Lucifer’s Friend and Black Widow. There is a great mixture of material on this CD and shows that the band have really grown and expanded. The band are currently looking for a new bass player (as Zito had to leave due to hearing problems), as well as a second guitarist and keyboard player. For more information you can visit the Rubric Records web site at: http://www.rubricrecords.com.